Political Bias Complaints Dominate Ombudsman Inbox : NPR Public Editor Complaints about bias have increased in past months. Here are some possible reasons why. 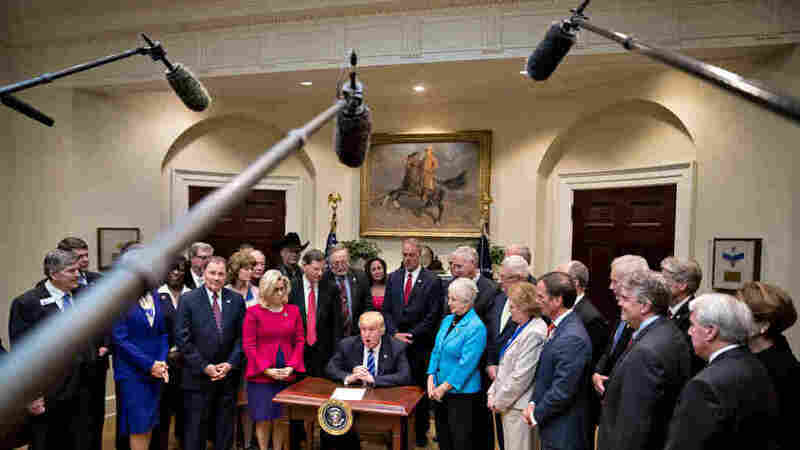 President Donald Trump speaks during a bill signing ceremony at the White House in March, surrounded by supporters, including Republican lawmakers. Complaints about what listeners hear as bias are as old as NPR, of course, and the history could occupy several columns. All of my predecessors have addressed the topic (see here, and here and here, for just some examples). The complaints tend to repeat: My office heard via Twitter last week about the "only" in this headline: "Only 98,000 New Jobs Were Created In March, Labor Department Says"; I'd note that the same complaint arrived in 2012 about the Obama-era headline "Just 96,000 Jobs Added To Payrolls." Still, it's no surprise that the number of emails about the topic have soared in recent months, along with the increased political polarization of the country. I wrote about this issue in February, as well, and it remains true that when we ask listeners to cite specific pieces that they feel are biased, it most often comes down to them hearing just one interview (with a Democrat or a Republican) and having missed the counter-balancing viewpoint elsewhere in the show or on a different day. "Confirmation bias" remains an issue, as well; as numerous social scientists have documented, humans are hard-wired to seek out or selectively hear information that conforms to their worldview. One aspect of this is the tendency to believe that viewpoints we don't share somehow receive too much attention in the news media. We don't track the "bias" emails by political persuasion, but they are roughly balanced between those who feel NPR favors liberals and those who say NPR is biased toward conservatives (with slightly more complaints about liberal bias). "It is clear that NPR's nationally syndicated shows, and in particular, Morning Edition, continue to push a conservative viewpoint and no longer provide any counter-balance of progressive views. The deck is stacked with conservative voices which remain unchallenged by your 'reporters'. What happened to NPR??????" "My wife and I have been listening to the news on NPR religiously for over three decades. We travel a lot and try our best not to miss our morning and evening news ritual. But lately we have been turning it off and picking up our cell phones to get the news. We have seen a real shift to covering and giving the Republicans lots of air time. It is very hard to listen to them. We feel there has been a real shift in your political coverage to the right. We suppose that you are afraid of losing your government funding. We have depended upon NPR to provide us with unbiased and thorough [news] coverage, and expect that you will return to that." "I am writing to see why, objectively, there is a clear anti-Trump, liberal-oriented bias against President Trump? I thought that NPR is a public-based radio organization that is supposed to present itself as objective given its public entity? Also, your radio programming within NPR News ... constantly frames their segments and stories in negative tone regarding President Trump and I would like to know why? I do not recall such negativity from NPR or WBUR [in Boston] during President Obama's tenure..."
From a listener in Miami, Fla.: "I am in disbelief at the unfair, biased coverage against this President. Every single piece I hear across the board in all NPR programs is negative and very hateful. It is so obvious. Shame on NPR." "I am concerned that with the election of our new president, NPR has lost its objectivity and balance in reporting. Almost all shows are chosen and produced to frame a picture against the current administration and its policies. I am an independent voter and have to relied on NPR and PBS for hearing both sides of issues for decades. I can no longer listen to NPR because of its now blatant bias." The old answer that journalists often give to such concerns — that we get equal numbers of complaints from both sides so we must be doing something right — no longer seems quite adequate because political polarization is so acute. But neither do I see a systematic bias of the kind many listeners, on both sides, say they hear. Instead, I'd argue that a few other factors are at play. Perhaps most important is simply the breadth of Republican perspectives today. There are those who support the president, of course, and NPR has heard from them. But other conservatives today are opposed to some of President Trump's policies. NPR has talked to them, too (see examples here, here and here), as it rightly should. Combined with Democratic critics, listeners may hear interviews with the latter as anti-Trump bias. Collectively, at times it has added up to more Republican voices on the air than Democrats. But NPR's journalists need to follow the story; one lesson NPR's newsroom took away from the 2016 campaign coverage is that it needed to pay more attention to the multiplicity of viewpoints, instead of seeing the divide as simply Democrat and Republican. Another factor is simple inattention to detail. A reader complained about the website headline "Beyond The Mike Pence Misogyny Debate, The 3 'Billy Graham Rules' You Haven't Read," writing that Pence "doesn't dine with women where alcohol is served unless his wife is present, and the headline writer calls that a 'misogyny debate?'" I'd agree with the reader; the word is misused here, but I don't agree with his further conclusion that this is evidence of systematic bias. Likewise, my office received a handful of emails from listeners and readers who complained about the parroting of Republican talking points last week when the word "force" was used in reference to the Democrats' actions surrounding the nomination of Neil Gorsuch to the Supreme Court, as in this headline: "Democrats Have The Votes To Filibuster Gorsuch And Force 'Nuclear' Senate Showdown." "On what basis does NPR assert that a Democratic filibuster 'forces' Republicans to change Senate rules? They have any number of other options, including the option of just leaving a seat unoccupied, which they invented last year. Please leave language like this out of your political coverage, or else clearly label it as op-ed content." "Trigger," or something similar, would have been a better choice of word. But "op-ed content?" I don't see it — in all the stories on the topic I can only find that word used in that headline and once by a host during an interview. The newsroom leaders with whom I discussed it don't see it, either. I've already argued that NPR needs to beef up its copy editing staff. I renew the plea that more attention be paid to details that will be seen by some as bias. Finally, several listeners have picked up on a change at Morning Edition in recent months, where the regular Monday morning commentary has been eliminated. Cokie Roberts, who had, in my opinion, been improperly paired with a conservative commentator, is now heard Wednesdays in what has become a popular feature, "Ask Cokie." Sarah Gilbert, the show's executive producer, told me by email that instead of a regular commentary on a fixed day, "we book commentators, journalists, activists, politicians etc. on merit, because they have an interesting take or insight on a story of the day." I applaud that approach to mix things up. That said, as some unhappy listeners have pointed out, one journalist, Jonah Goldberg, of the conservative National Review, has popped up as a commentator more frequently than most (he has been on five times since Feb. 3). No liberal commentator has had such a recurring platform, and Goldberg is not always identified by his political views, leaving listeners to guess. Gilbert said the show is "careful to make sure we have a varied mix of perspectives on our air, of course," and that it will include a more complete identification of Goldberg's views in the future. Booking commentators is not an exact science; producers must find guests who are articulate, up on the issues and, importantly, available to do an interview, sometimes at a moment's notice — and often at an extremely inconvenient hour, for example 6 a.m. I appreciate Goldberg's commentary and rarely find it following predictable talking points. Still, I would hope that as Morning Edition breaks out of its past format it would add more voices from across the political spectrum.